Comedian Dave Chappelle says he may never return to his hit Comedy Central show if the cable station goes through with plans to air new episodes culled from material he filmed before leaving the series. "I feel like it's kind of a bully move," Chappelle told the Dayton Daily News. "That's just how I feel about it. I don't know if that's the case. But if people don't watch it, then I'd be more than happy." Last May, Chappelle stunned his fans and the entertainment industry by skipping out on a $50 million contract and leaving "Chappelle's Show" in mid-production. He spent two weeks in South Africa before returning home to his farm near Yellow Springs, Ohio. He has since resumed performing live standup. 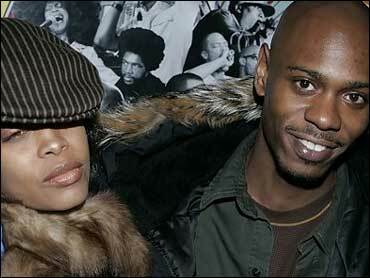 Chappelle said his possible return to "Chappelle's Show" is still up in the air. "But I think if they air that stuff, I can't see how I'm going to be able to," he told the Daily News. "That will damage our relationship." Comedy Central has said in the past it plans to air the material, but wouldn't comment on any current specific plans. "We are still waiting patiently for Dave to return to work, but we know that our viewers are looking forward to seeing the material he produced for the third season," Comedy Central said in a written statement. At the premiere of his new movie "Block Party," in New York, Chappelle did not seem eager to return to the show anytime soon. He said he was enjoying his current comedy tour and hinted that his future plans were open. "I've been having a blast. There's something about doing stand-up that's cathartic," he said. "And there's something about touring with friends. I've never toured with friends before. "Right now I'm just enjoying all of this," he added. "Then it's back to the drawing board."